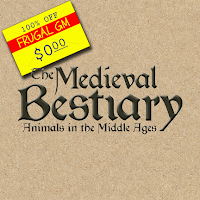 This week's Free GM Resource is a collection of creatures from The Medieval Bestiary. While the list of beasts isn't extremely large, and there seem to be a lot of mundane creatures on said list, The Medieval Bestiary is still quite useful because there are a lot of links and files to historical resources. Basically this is a great site to start some research on creatures/beasts from the era. Even some of the more mundane creatures have some surprising "aspects" as believed during that bygone time. A nice way to add some unexpected color to your game.